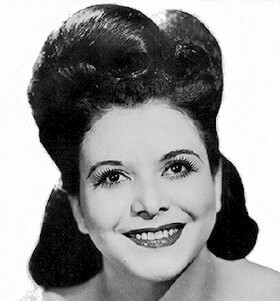 Above: Savannah Churchill (photo from 1950). At various times, she was backed by The Striders, The Four Tunes (Sentimentalists) and The Five Kings. Above: Regal 468 45 RPM label. The Striders recorded on their own for the Capitol, Derby and Apollo labels. FROM MARV GOLDBERG 2/17/03: The Striders, on record, according to Charles Strider, always consisted of Eugene Strider, Charles Strider, James Strider, and Ernest Griffin. There was a guy named Al Martin who was a fill-in singer for them on many occasions over the years, but he never recorded with them. 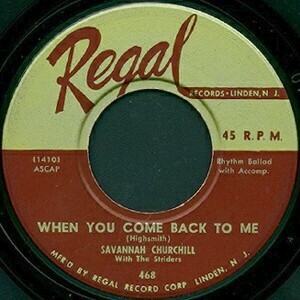 Click on an option below to listen to "When You Come Back To Me" in RealAudio. Above: The flip side of this record. 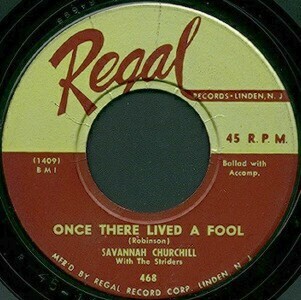 Click on an option below to listen to "Once There Lived A Fool" in RealAudio.